Kate Doupe dreamed that the Waubuno had capsized and she and her husband, Dr. William Doupe, and the rest of the passengers were struggling in the waters of Georgian Bay . She begged her husband to take the overland route. Kate and Dr. William Doupe had just been married for a week and both were anxiously waiting for the Waubuno to pull away from its Collingwood, Ontario dock on the stormy Saturday morning of November 22, 1879. 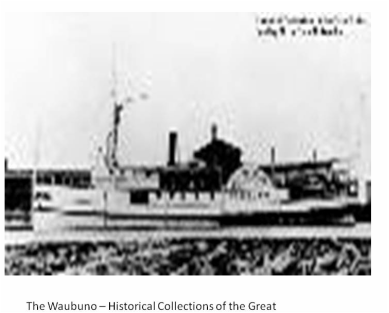 A side-wheel paddle steamer, the Waubuno got its name from an Algonquin Indian word that means “Black Magician” or sorcerer. During the 1860s and 1870s, it carried passengers and freight from the Northern Railway’s railhead at Collingwood to northern destinations including Parry Sound and Thunder Bay. The Doupes were anxious about the Waubuno ‘s departure for different reasons. Dr. Doupe wanted to quickly set up his office in the tiny village of McKellar where he and Kate planned to settle. His bride Kate didn’t want to travel on the Waubuno, especially since the weather had taken a turn for the worse. A few nights before, Kate had dreamed that she and William and the other passengers were struggling for their lives in the icy water of Georgian Bay with a tremendous weight pressing them down. Kate couldn’t swim a stroke and she begged William to travel overland to McKellar. William pointed out that all of their possessions were already aboard the Waubuno. He tried to calm his bride’s fears. People in the communities along Georgian Bay were also anxiously waiting the supplies that the Waubuno carried, which they needed to tide them through the long hard and frigid winter. Captain George Plumpton Burkitt, the 32-year-old captain of the Waubuno, finished loading the supplies aboard the Waubuno, packing it to the maximum. Despite his strenuous objections, the Georgian Bay Transportation Company ordered him to take two tons of barreled whiskey on the upper deck of the Waubuno. Blustery autumn weather had blown away the Waubuno’s regular schedule of 7 a.m. sailings on Tuesdays, Thursdays and Saturdays, as gales began slashing across the Great Lakes. Captain Burkitt had been trying to leave Collingwood since Tuesday, November 18th. At 7:35 a.m. that Tuesday, the Canadian meteorological reporting station at Saugeen, now Southampton, on the Lake Huron shore had recorded snow and a 43-mph northwesterly wind. On Thursday morning, November 20, Captain Burkitt decided it was still too rough to depart. He and the Waubuno passengers would have to resign themselves to another day or two in Collingwood. On Friday November 21, Kate Doupe told people about her nightmare and tried to convince her husband to find a different mode of travel. The Waubuno’s next scheduled departure fell on Saturday morning, November 22, 1879. Captain Burkitt was more anxious to leave than Dr. Doupe. The Georgian Bay Transportation Company of Collingwood owned the Waubuno and the navigation season shrank daily. The Saturday sailing would have to make up for the two abandoned trips and any more delays would mean a loss in passengers and revenue before Collingwood’s harbor closed on December 7th. The storm slowed down long before sunrise on Saturday morning. At 1:35 a.m. Saugeen recorded snow and an 18 mph southerly wind and the conditions at Collingwood were about the same. Captain Burkitt decided to take a chance and the Waubuno departed her dock at 4 a.m., in a brisk wind. The captain ‘s quick departure also stranded several passengers who had decided to spend the night at local hotels. Kate and Dr. Doupe and about eight other passengers, fourteen crew members and a full load of cargo that included barrels of flour and apples, chests of tea, a team of horses, one or two cows and a few dogs sailed with the Waubuno. The break in the storm didn’t last long. By 7:35 a.m., the Saugeen station recorded a 24-mph south wind with snow. The observation station in Parry Sound also recorded snow. 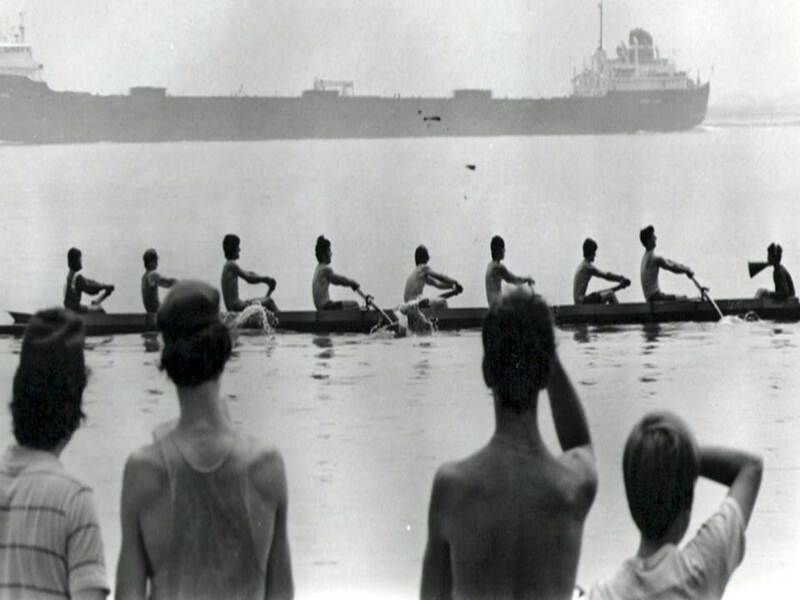 The heavily laden Waubuno thrashed across Nottawasaga Bay, headed for Christian Island, 17 nautical miles to the northeast. The Waubuno had almost reached the end of her journey. Past the sheltered waters of Christian, Hope, and Beckwith Islands, she had to cross the open waters of Georgian Bay to reach the islands of the bays eastern shore on the final approach to Parry Sound. When the Waubuno didn’t arrive in Parry Sound, the tug Millie Grew went to look for her and returned to port with the word that it had found part of the wreck, including Dr. Doupe’s medical bag, a life preserver with the Waubuno’s name on it, the ship’s ledger, and a life boat. Barrels of apples, flour, and other freight washed up along the shore, but no bodies were ever recovered. In the spring of 1880, searchers on Moberly Island found an upturned hull that was identified as belonging to the Waubuno. In 1959, SCUBA divers discovered the location of the wreck of the Waubuno at Black Rock near the Haystack Island and found the machinery that had spilled from the Waubuno. Mariners theorized that Captain Burkitt hit an uncharted shoal northward of Lone Rock in a blinding snowstorm. A rudder from the Waubuno is displayed at the Huronia Museum in Midland, Ontario, and the Waubuno’s anchor can be seen at Waubuno Park in the town of Parry Sound. Kate Doupe's glove, the only trace of her found from the Waubuno, was given to her mother.